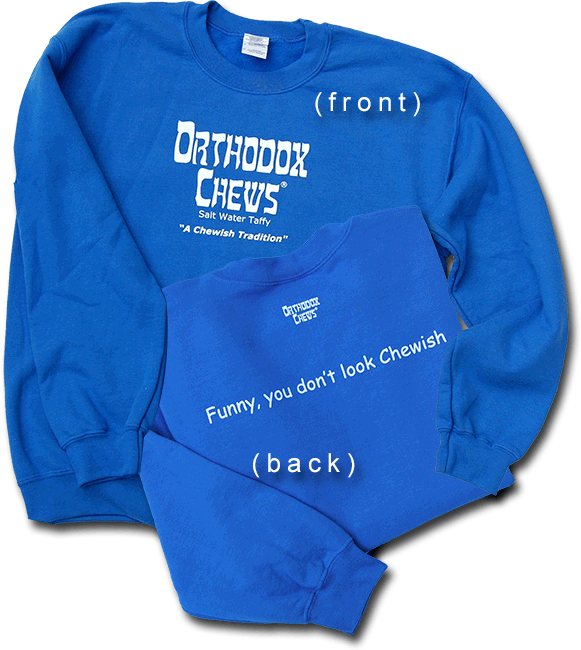 Your Orthodox Chews Sweatshirt is a magical garment. Walking on water will not occur and the planets may not align, but the small, simple, fun things of life will touch everyone who touches your Orthodox Chews Sweatshirt. The message to humanity is found on the back of your Sweatshirt. “Funny, you don’t look Chewish”. This royal blue heavyweight quality Sweatshirt is a 50/50 cotton/poly blend. Orthodox Chews is a Registered Trademark. Copyright © 2008-2016 David Neumann, All Rights Reserved.